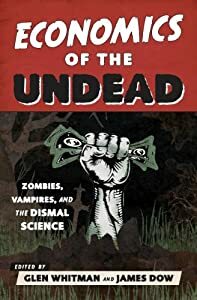 Freakonomics Radio recently broadcast a highly-entertaining program on Economics of the Undead on 30 October 2014 (“What can vampires teach us about economics?”). Among the topics discussed on that podcast was the possibility of legal markets in blood, a topic near and dear to me — see my essay “Buy or Bite?” in chapter 12 Economics of the Undead. In addition, the discussion of blood markets on Freakonomics Radio generated a number of original and insightful comments. Many commentators objected to the possibility of blood markets, offering several thoughtful objections specific to vampires and their way of life. I have thus decided to write this post to respond to these various objections. “Y’all know that … vampires aren’t real, right?” [Comment by Truth & Beauty.] Let’s call this the “hypothetical entities” argument. “would you accept to work extra hours [with your boss] … if your boss is one of them?” [Comment by carlosmx37.] Call this the “fear factor” argument. “most vampires consider themselves to be superior beings to humans … and as such have compunction about ‘stealing’ blood to feed them[selves].” [Comment by Owen.] Call this the “vampire superiority complex” argument. “taking blood by force may be so culturally ingrained among vampires that … there is cultural barrier against [trade].” [Comment by Cuylar Conly.] The “cultural path dependence” argument. “Vampires ‘procreate’ via their bite” and “Vampirism is contagious” [Comments by scott fowler and Cuylar Conly, respectively.] The “peak blood” argument. Before proceeding, notice how these various anti-choice arguments build on each other. 1. Vampires do not exist, so the idea of markets in blood is ipso facto preposterous. 2. Even if vampires were real, most people fear such cunning creatures and would thus be reluctant to engage in any sort of voluntary trade with them. 3-4. Even if we could overcome our fear of the undead, vampires prefer raiding to trading. 5. And even if we could incentivize vampires to buy our blood on a consensual basis – instead of taking it by force – vampires would overuse or oversuck their human resources and turn us all into vampires. I will focus on the first two objections in this blog post and then address the remaining objections in a future post. The crux of this objection is that vampires are not worthy of academic study because vampires are not real — they are hypothetical entities. In any case, even if vampires are imaginary creatures, thought experiments about them are still useful because they help clarify our thinking by revealing anomalies and logical inconsistencies. In the words of the historian of science Thomas Kuhn (The Essential Tension, 1977, p. 252), a thought experiment, or the careful analysis of an “imagined situation,” is useful because it confronts its audience with unanticipated consequences of our ordinary way of thinking, and thus thought experiments, especially outrageous and far-fetched ones, are often capable of producing the new insights. But why is my particular thought experiment about blood markets any good? Because this particular example illustrates a larger problem, the problem of “legal failure” or legal barriers that prevent trade and stifle markets. We call such legal barriers to trade “legal failure” because such barriers not only make us worse off; they often lead to violence and exploitation. Vampires and humans are rarely depicted in cooperative terms. We rarely, if ever, see vampires bargaining with humans to buy and sell blood. Instead, vampires are usually depicted as cunning and stealthy predators, and conflict between humans and most vampires is the norm. My thought experiment, by contrast, presents an alternate vampire world, one in which blood markets are legal, and poses a new hypothetical question: what would happen to the level of vampire violence in a world in which the purchase and sale of blood was legally enforceable? Would vampire violence go up, go down, or stay the same? However one answers this hypothetical question, my simple thought experiment requires one to explain and defend one’s reasoning. Therein lies the value of thought experiments generally. In short, just because vampires are fictional or imaginary creatures doesn’t mean we should ignore them. Even if vampires are make-believe, the vampire world is still worth studying because it invites us to think about the nature and sources of violence. What about the “fear factor,” however? That is, why should anyone trust a vampire? This is not a trivial objection. After all, given their bloodthirsty natures and reputation for bloodlust, vampires appear to be especially unreliable — if not downright dangerous — trading partners. The problem of fear — the fear factor — really boils down to a problem of trust. Simply put, if you don’t trust vampires (or if vampires don’t trust you), you will most likely refuse to deal with them. And who can blame you? Do you really want to sell your blood to a bloodthirsty, super-secretive, nocturnal creature? By way of example, you might want to sell a pint of blood to a vampire for a given price. But what’s to prevent the vampire from taking your blood without payment, or worse yet, what’s to prevent him or her from taking two or three pints of blood, or all of your blood? In short, trust is a necessary condition for markets — especially blood markets –to work properly. Without trust — for example, trust that vampires will keep their promises and not act opportunistically by biting you instead of buying from you — people are less likely to engage in market transactions in the first place. First, although I am not an economist, I would expect the price of blood to reflect the level of fear or risk of opportunistic behavior by vampires. Generally speaking, the more risky or volatile a given market is, the higher the price or reward must be in order to induce people to participate in such a market. The greater our fear of vampires, the higher the price of blood. …which leads me to my third and most important point: the problem of opportunistic behavior and lack of trust is actually an argument for — not against — legal blood markets. When markets are legal it is generally easier for both buyers and sellers to trust each other and make credible commitments because there is a legal enforcement mechanism to enforce promises and punish opportunistic behavior. By contrast, opportunistic behavior is more likely to occur in black markets, when markets are completely unregulated or not legally recognized. In short, the deeper problem of trust — the fear factor — can be solved with credible commitments. Clear legal rules and third-party enforcement of contracts, for example, would make it possible for us — both the living and the undead — to build up sufficient levels of trust to get trading off the ground. But even if we could overcome our dread and fear of vampires, could vampires overcome their contempt or disdain of us humans? What if, simply put, vampires don’t want to trade with us at any price? Stay tuned … I shall address these questions in my next blog post. This entry was posted on Monday, December 15th, 2014 at 11:47 am	and posted in Uncategorized. You can follow any responses to this entry through the RSS 2.0 feed. Very good rebuttals to arguments given on Freakonomics. Have you considered the under-allocation of blood already being given to hospitals and the free-trade of blood would impede on life-saving donations? Legal blood markets would most likely take away for those that are in desperate need of blood. The most valuable blood (also the most rare) will become much too expensive that it would be impossible for the average person to afford it.